Can I start by asking a bit about your road from Scotland to the West End, tell us about your background and what inspired you to become an actor? I feel like my journey to the West End was a series of very fortunate events. I started acting at an amateur level when I was about 17 but didn’t consider it seriously as a career. I studied Mechanical Engineering at Aberdeen University for a year before deciding a life behind a desk wasn’t for me. I spent about a year gigging and doing bits and pieces before I auditioned for London Studio Centre (I’m still amazed that I got in as my talent was raw to say the least!). After a few years of training I was lucky enough to get a job as swing in We Will Rock You. I think my theatrical heroes would be Stephen Sondheim and Jason Robert Brown. I’m a huge fan of the complexity and intelligence in their compositions. You have a very varied CV what have been the highlights up to now? I’ve been very lucky so far in my career, I had a lot of great opportunities whilst performing in We Will Rock You. I sang at the Olympic handover ceremony in front of Buckingham Palace and performed with Queen on their world stadium tour. I also think performing “School’s out” with Alice Cooper at Rock of Ages was pretty cool! I see you’ve done a bit of work in Germany, did that help you when preparing to play Franz! I lived and worked in Cologne for 18 months and loved every second of it! I’ve got a real soft spot for Germany and if the right role came up I wouldn’t hesitate to return. I think it did help with my preparations for Franz, I’ve spent lots of time surrounded by Germans speaking English so I’m pretty good at impersonating the accent. 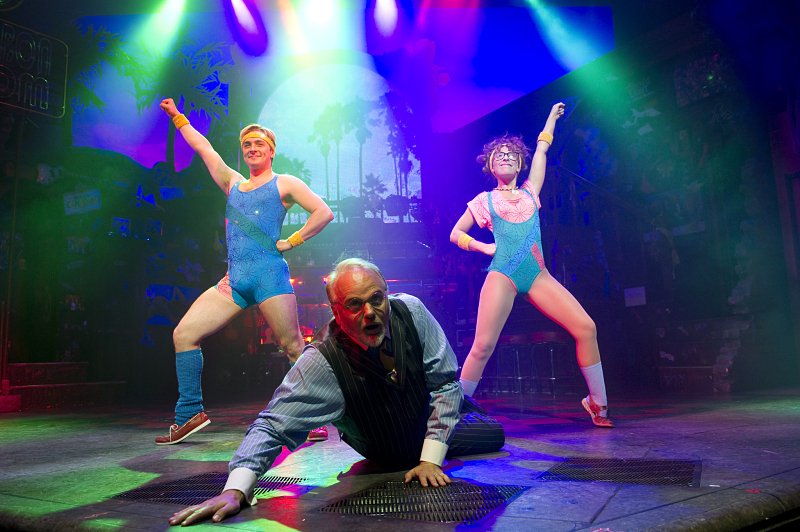 Tell us about Franz in Rock of Ages – he’s certainly an unforgettable character – is he as much fun to play as he is to watch? He is great fun to play! The problem is that he has so much energy, it gets tough to keep up sometimes. I’m very lucky that he’s such a funny character and the audience warms to him every night. I have some great lines and the show certainly never gets boring for me. You are starring in eight shows a week, in a long running show how do you keep your performance fresh every night? It’s the toughest part of my job. I think it’s important to re-invent the character from time to time and make sure that you always try new things, sometimes they won’t work but that’s how I find new things. I’m very lucky that I work with such great actors who are constantly throwing new things at me which makes it easy for me to keep what I do fresh. If it’s fresh for me then hopefully it’s fresh for the audience. How do you unwind during your time away from the show? I ride my motorcycle as much as possible! I love riding the bike into the country with my tent on the back and spending a few days living outside, I like to get away from London and relax. I also play the guitar and I enjoy watching films and on a Sunday I can be found sitting in the pub with a roast dinner. A lot of actors are talented musicians, you say on your Twitter profile that you’re a rock star wannabe – are you making any plans to pursue that? I’m 30 so I think I’ve missed the rock star boat, but I do really enjoy playing the guitar and I’d like to get out and do more singing and playing. What music particularly inspires you? I love Rock music which is why Rock of Ages is kind of my perfect job. When I got the audition I remember digging out all the songs I’ve always wanted to sing for auditions but were never suitable for musical theatre, I ended up singing Bon Jovi’s “In these Arms”. It sounds like a cliche but my main aim is to be happy in my work and I don’t really mind what I’m doing, as long as I can make a living of course! I’d like to try TV and film acting but for now I’m very happy doing musicals. What can we expect next from Sandy Moffat? Who knows?! 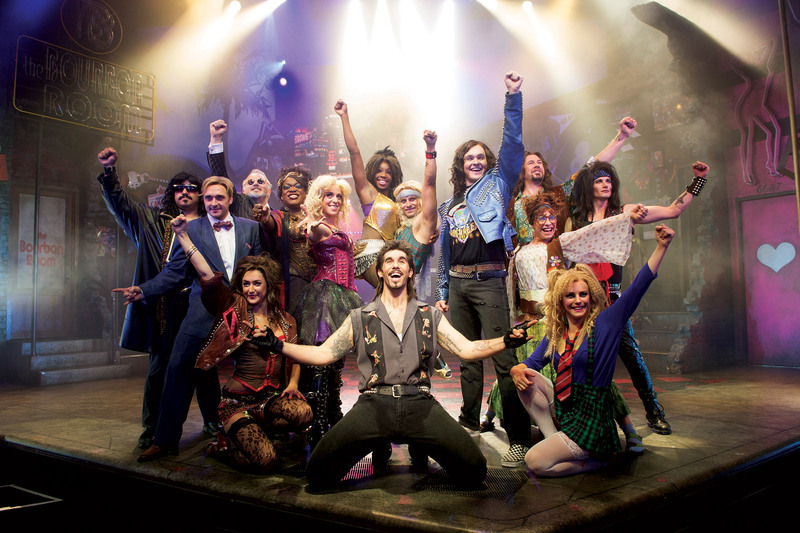 My current contract at Rock Of Ages ends in September and it’s too soon to be making plans. The life of an actor is an unpredictable one so your guess is as good as mine. Finally, how would you describe yourself in three words?